Dylan’s symptoms started in early April 2014 with a random vomit at nursery. We put it down to eating too much and playing too energetically with his friends. A few days later he threw up again. No warning, no other symptoms and he hadn’t over-indulged or been particularly energetic. His baby brother was also unwell and had recently been hospitalised so the doctors chalked it down to a virus going around. Over the next few weeks Dylan’s brother started to get better whereas Dylan got worse. He was off his food and even refused to eat ANY of his Easter eggs, much to the delight of his older brother. He was throwing up daily and, worryingly, he was clutching his head saying ‘ow’. What threw us was that he only complained once or twice a day for 5-10 minutes and then he was absolutely fine again. We started to refer to these occasions as ‘episodes’. They were clearly painful, traumatic but in the grand scheme of things, short lived. Then the frequency and severity of these episodes increased and I noted that they were worse on the morning school run. Again, I contacted the doctor and was seen straightaway. We were transferred to the hospital where he appeared to be the healthiest child in A&E. He was running around and was into everything and as such, we weren’t a priority. After hours of playing with the toys, we were moved to a cubicle. Then, seemingly out of nowhere, Dylan has the worst episode yet. He threw up everywhere, was screaming in agony, came out in a head-to-toe rash and was clutching his head. The doctors were confused. They ran countless tests and they all came back negative. They admitted him for further tests, yet they came back negative too. The following day they broached the subject of discharging him and seeing him as an outpatient, something we refused. There was something wrong with our son, they just hadn’t found it yet. They HAD to keep looking! An MRI scan was arranged to rule out anything sinister, such as a brain tumour. At around 6.30pm on a Friday in early May we were told the results were in. What followed was the worst conversation of my life. The doctor said the results showed a large tumour, the size of a golf ball in our little boy’s cerebellum with a further four areas in his spine. He had a brain tumour. That was all I could listen to. I left my husband with the doctor whilst I tried and failed to tell my mum, a retired nurse, the diagnosis. I eventually found the words and shattered my mum’s world, just as mine had been shattered minutes before. The rest of that evening was a blur. We were transferred to a hospital 30 miles away and arrived in the early hours of the next day – on our wedding anniversary. The baby had come with us and my mum had taken my oldest home. That night all four of us slept on the ward. The next morning we were allocated a Ronald Macdonald home, which became our home from home for nearly 20 days. Our oldest was completely thrown. He’d left the hospital with his Nan and she moved into his home, taking him to and from school, to his swimming lessons, to his friends – all the things his mum should be doing. Back at the hospital, everything was moving so fast. Dylan needed surgery. Surgery that was so dangerous that he may not survive it. If he did survive the surgery he may be left with permanent disabilities, unable to breathe, talk, think. The list was endless. This was surgery that he HAD to have. The days leading up to his operation were hard. We tried to act normal. I tried not to burst into tears, and we tried to have fun. Dylan had his friends and family visit and we basically took over the ward. The steroids had given Dylan his appetite back so we had a pizza place on speed dial. The day of the surgery was long and difficult for all of us. Taking Dylan to theatre knowing that it may be the last time I saw, kissed or held him was torture. I lost count of how many times I wanted to just turn and run with him in my arms, and keep on running until this nightmare was over. Fortunately, the surgery was a total success and, bar a few setbacks, Dylan was back on his feet in no time. Then there was the anxious wait for pathology. The tumour was cancerous. Grade 4 medulloblastoma to be exact. 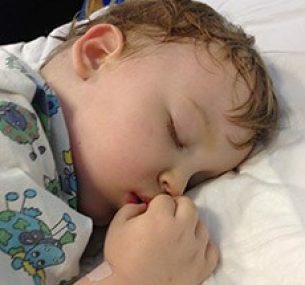 We were sent home to wait while the doctors decided a treatment plan. Treatment was scheduled to start mid-June, but frustratingly it was pushed back a week. Then, at last it started. We could start fighting back. Dylan was being put on an existing protocol that had been modified by a team in Germany. It hadn’t been trialled over here yet, but it was seen as the best course of action. It was very intense and meant that Dylan would be treated every other week for the next 30 weeks. He would be an inpatient for each treatment week, 30 miles from home. He had a Hickman line inserted and was ready to go. My husband was signed off from work so he could stay at his bedside whilst I drove back and forth every day around school times. Dylan’s hair fell out almost overnight and soon after he lost his first Hickman line to an infection. The chemotherapy hit him hard and the sores in his nappy were truly shocking. His bloods plummeted and took time to recover so he was usually pale and lethargic. His taste buds had changed and he had no idea what he liked anymore. In October we experienced ‘scanxiety’ for the first time when he had a scan to check progress. The fear of the results is all-consuming, yet the not knowing is just as bad. Fortunately the scans were positive and showed improvement. Dylan’s protocol ended on Christmas Eve 2014. We went home and had a fantastically relaxed Christmas and New Year. In early January we celebrated Dylan’s third birthday and held a party for all his friends. We dared to dream of a life without fear, a life where Dylan was cancer-free and happy and healthy. That dream was dashed at the end of January when an MRI scan showed some ‘areas of concern’ in Dylan’s brain. We went home convincing ourselves that these areas were only scar tissue, or contrasting anomalies, or anything plausible that wasn’t cancer. Unfortunately that wasn’t to be. He went for another scan in February. It showed that the cancer had regrown and spread at an alarming rate. Dylan needs further, more aggressive, more dangerous, more risky, more DAMAGING treatment. 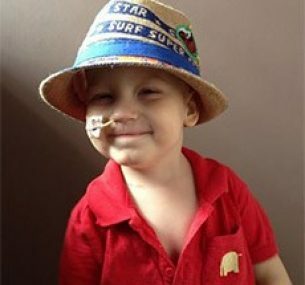 He needs six weeks of radiotherapy, a stem cell transplant and an incredibly high dose chemotherapy, delivered over many months. But above all Dylan, and all the other children with cancer, needs kinder, less damaging and less toxic treatment protocols. These children need the chance to be able to beat cancer and still lead long, happy and healthy lives. In March 2015, Dylan had just relapsed and what followed was an intense six weeks of radiotherapy and general anaesthetic every day for six weeks. After that, he eventually had a couple of weeks off allowing us to take him took on a Make A Wish Trip to Disneyland Paris. When we got back he started his one year chemotherapy. He had a few complications such as contracting various infections and chicken pox whilst in hospital but otherwise it went reasonably well. He finished the treatment around 12 May 2016 and we are now a year post treatment. We’ve had stable scans, but he has been left with long term side-effects from the treatment and the cancer itself. He no longer produces his own hormones and has to take growth hormone injections every day, his body does not produce his own thyroxin so he has to take tablets for this, he has to wear hearing aids in both eyes which he hates and has to wear glasses. The cancer on his spine has led to further complications which include having very weak legs; Dylan needs a lot of physiotherapy. He is now registered disabled. His ankles and feet roll in, so he has to wear special insoles to keep his feet in the right position. Our last option is to have splints to help support his feet and I know Dylan will not like that at all. I have two other children; my seven-year-old son is really good. He helps me look after his younger brothers and he helps with the washing up. I know he does miss out on what other seven-year-olds do. My three-year-old son, as young as he is knows how to dress himself, gets his own clothes, and puts on his shoes. We are a small team and we manage as best as we can. Dylan is now five years old and is doing really well, he is happy and has started school. He is currently in the same school as his older brother. The school have been great and has supported Dylan with his education. He has a lot of friends and we try to keep busy by going to a martial arts class to help with his balance. Dylan is healthy considering his complications.